Two Sided Narrow Horizontal Hanging Sign -- custom made hanging sign with your address, name, or message. For homes, professional offices, and businesses. Made in USA. 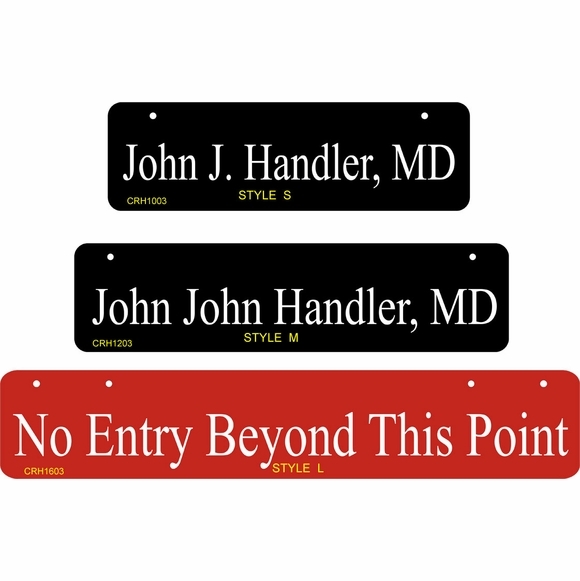 This series of 3" high, double sided hanging signs should accommodate most of your one-line plaque requirements. The slim rectangle with radius corners is large enough to get your message out without being intrusive. You can insert names, numbers, welcome statements, or the facility management directions of your choice. Three sizes with the same personalization on both sides. Style S: 10"W x 3"H" with two 1/4" mounting holes on 7.5" centers. Holds up to seventeen (17) 1.25" characters. Style M: 12"W x 3"H with two 1/4" mounting holes on 10" centers. Holds up to twenty (20) 1.25" characters. Style L: 16" x 3"H with two sets of 1/4" mounting holes on 10" and 12" centers. Holds up to twenty six (26) 1.25" characters. All plaques are 1/8" thick. Colors: black with white characters and red with white characters.